If you recently bought a 4K Ultra HD TV or you're thinking about scooping one up soon, there is no problem for your 4K videos watching. But things are different if you don't have a 4K TVs, 4K video players and even any devices compatible with 4K videos. You'll find your 4K video won't play at all. Worse still, even if you can play 4K on your devices, it's much overburdened since an hour of H.264 4K video could grab at least 5GB of storage, not to mention it will take too much use of your devices. Thus, for those with 4K playback issues, their business comes to how to enjoy 4K UHD content in all of its sweet, eye-popping glory on more devices like Mac/PCs, iPhone iPad Android with excellent quality but no 4K video file size limit. The answer is a 4K to 1080p converter that converts, downscales and compresses 4K UHD to 1080p Full HD. Downscale and compress 4K to 1080p, 720p HD and even 640p/480p/360p SD almost with zero quality loss, but reduce MP4 4K file size to the hilt. Convert SD/HD/2K/4K Video on Mac and Windows between 180+ formats, such as AVI to MP4, MKV to MP4, WMV to MOV for editing on iMovie, or playback on Apple TV, iPhone, iPad, Android etc. Transcode video codec such as DivX, VP9, H264 to HEVC/H.265 to perfectly compatible with the iPhone, iPad, Mac supporting iOS 11 and macOS Sierra. Compress up to 50% video size with original quality. No.1 fast speed to process 4K UHD to 1080p/720p HD, 1080p to 4K UHD with the support of multi-core CPU, HT, Intel QSV hardware acceleration, and especially Auto Copy Mode which convert video to another container in amazing fast speed without quality loss and unnecessary transcoding and encoding process. The 4K to HD downscaler is also adept at downloading 4K from YouTube, cropping blank bars of video, trimming/cutting videos in clips, adding subtitles and watermarks, recording screen activities, making photo slideshows with audios etc. How to Convert and Downscale 4K to 1080p? Firstly, this 4K video converter is compatible with Mac OS X 10.5 and above (including macOS High Sierra, Sierra, El Capitan) and Windows 10/8.1/7/XP. For a start, you can download the program according to the desktop you're running. Step 1: Load your 1080p FHD video to the program. Launch the program, then click on + Video, choose the target 1080p FHD files from computer, and tap Open to load 1080p videos. Or you can also simply drag and drop the 1080p HD video to the current window. After video loaded, there pops up a window for output format choosing. For a wider compatibility and smaller video file size, you're highly recommended to convert and compress 4K UHD to 1080p in H.264 MP4 format. 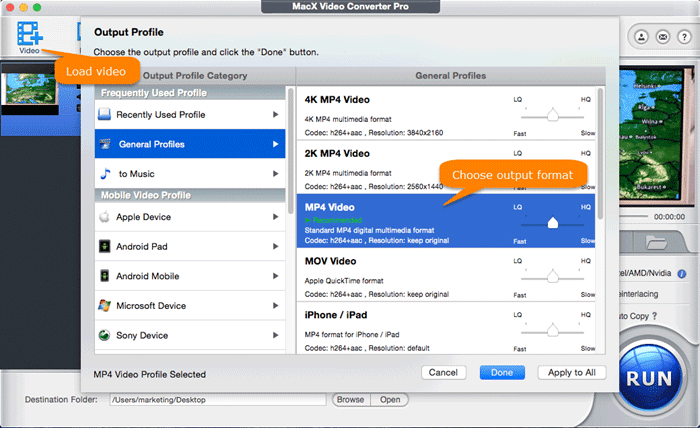 So click on General Profiles > MP4 Video > Done to choose MP4 as your output format. Click on , and you're able to adjust parameters like video codec, resolution, frame rate, aspect ratio, bitrate etc. Choose 1920×1080 from the resolution drop-down list and click OK to downscale 4K UHD to 1080p Full HD. Step 4: Start 4K videos downscaling now. Optionally, you can click on Browse to determine where you'd like save your compressed 4K video to. Then tap RUN to start converting and downscaling 4K ultra HD to 1080p now. By the way, you can convert 8K to 4K, 1080p to 720p and more with the same steps. Users may have different needs of conversion. Some would like to finish 4K UHD downscaling fast and care less about the quality, so check the Hardware Encoder box on the right-hand side to take advantage of Intel/Nvidia/AMD hardware acceleration. While some others prefer a high quality output video, you can check the High Quality Engine and Deinterlacing options to optimise the image quality, though this will have some impact on speed. Still, if you just downscale videos to 1080p from 4K without changing the video codec, you can tick the box of Auto Copy, which will speed up the conversion up to 10 times. The reasons why you should convert HD to 4K may be various. But ultimately, you must want to enjoy a clearer and crisper 4K resolution video. Here I pick up some users' appeals about why they want to upconvert 720p/1080p HD to 4K resolution. Perfectly convert my high def MKV files to MP4 format. Best converter from all I used until now. I can watch my favorite 4K videos on iPad. 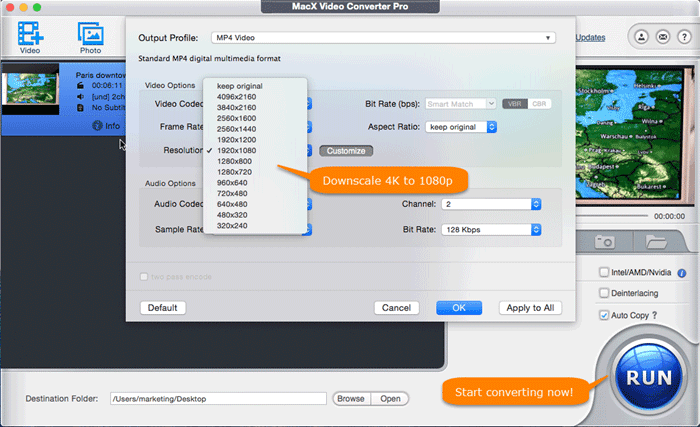 MacX Video Converter Pro, the best 4K to HD video converter, can quickly downscale 4K to 2K, 1080P, 720P with sharp image quality among video formats, transcode HEVC to H.264, VP8 to VP9, H.264 to H.265, MKV to MP4 etc. Still, it does well on upconverting 1080p/720p to 4K as well. Is It Possible to Play 4K UHD on Macbook Pro/Air?